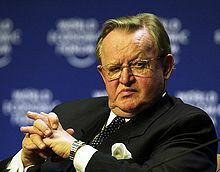 Martti Oiva Kalevi Ahtisaari (born 23 June 1937) is a former President of Finland (1994–2000), a United Nations diplomat and mediator noted for his international peace work, and the recipient of the 2008 Nobel Peace Prize. You have to be rather straightforward with your clients. You can't tell the parties only nice things. It's very important to be able to act properly. You need financing, and you never have enough. Since I know that about a million people have been killed by the government of Iraq, I do not need much those weapons of mass destruction. During the next 10 years about 1.2 billion young 15-to-30-year-olds will be entering the job market and with the means now at our disposal about 300 million will get a job. What will we offer these young, about a billion of them? — or will we leave them to be recruited by criminal leagues and terrorists? … I think this is one of the greatest challenges if we want to achieve peaceful development and hope for these young. You have to be rather straightforward with your clients. You can't tell the parties only nice things. This is not an entertainment show; it's not reality television either. This page was last edited on 16 August 2018, at 11:05.